I am so in love with these today. 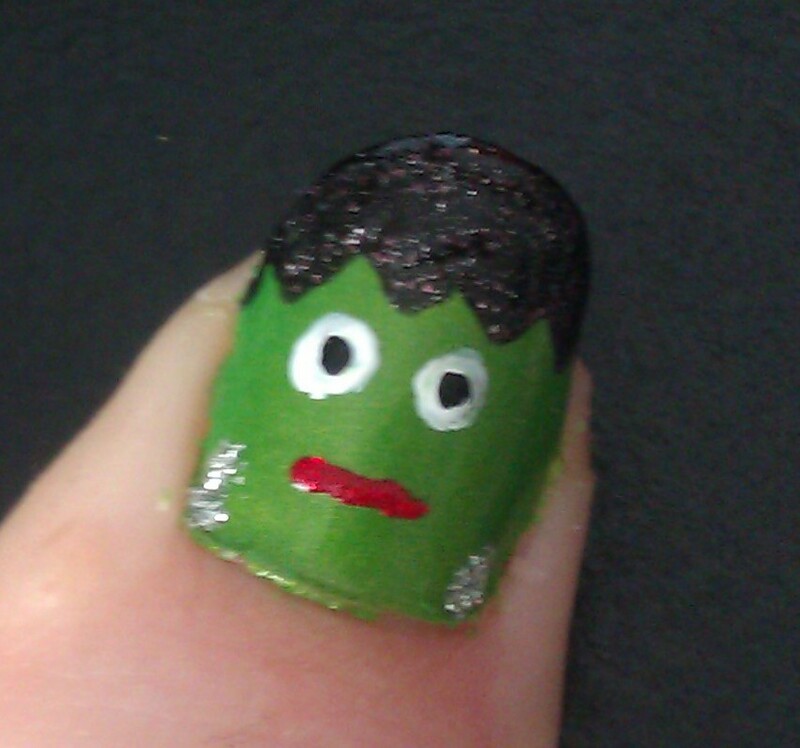 Frankenstein was one of my favorite books in college, so I’m rocking him on my thumbs with some nail art! 1 Apply Gelous Advanced Nail Gel Coat to clean dry nails. 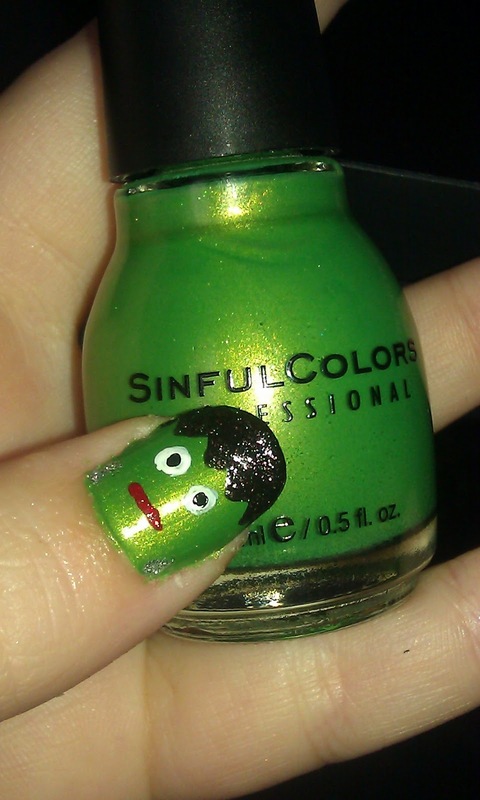 2 After nails are set, apply 2 coats of Sinful Colors Profession Nail Polish in Happy Ending, or to your wanted opacity. I chose this color because it adds a touch of sparkle and nice shine as your base coat meaning you can use muted colors for detailing as desired. 3 Start with using your finest nail art tool point ( I recommend the set I bought off amazon! Check the left bar on my most requested items!) 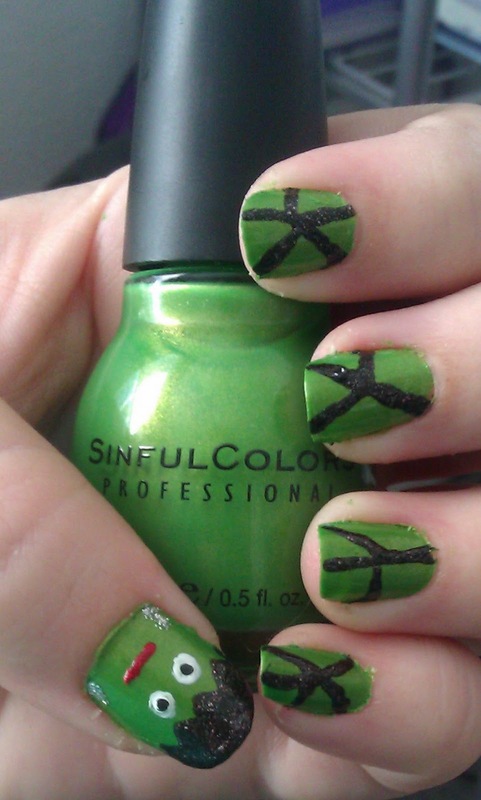 and create the zig-zag line carefully using black polish. I highly recommend LA Colors Art Deco Polish and to use it with tools, simply add a bit to the top of a notecard/cardstock to use as an artists palette. Take your time as you want a clean line. My shade is LA Colors Art Deco in Black Sparkles which has a gorgeous silver sheen. 4 Apply 2 dots using a fine-medium nail art tool and white polish for the eyes. 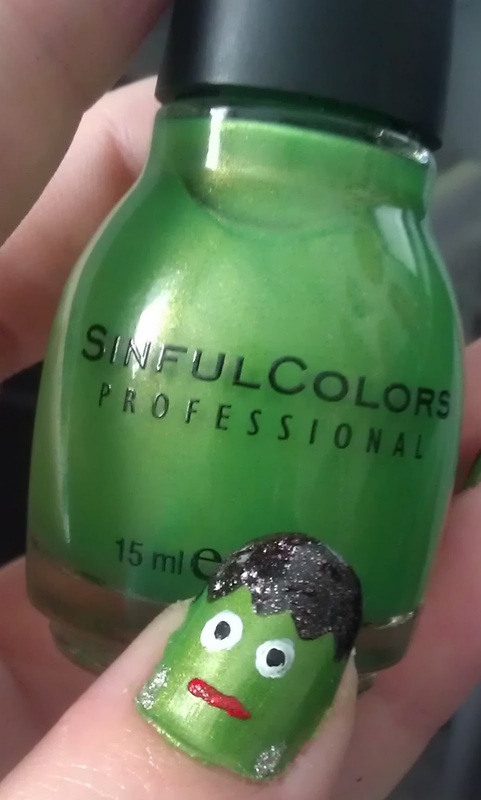 If your dot is too raised, use your smallest point to swirl lightly to even it out then fill in any green areas. I used LA Colors Art Deco Polish in White. 5 Dot 2 super shimmery silver dots at the base of your nail on either side for the bolts. I used LA Colors Art Deco Polish in Silver Glitter which I find to be SUPER condensed and awesome for this. 6 Make a line with a red (I chose sparkly) polish with your thinnest line. I used LA Colors Art Deco Polish in Red Glitter, once again a SUPER condensed glitter. Probably my most used I used LA Colors Art Deco Polish for holidays because its great for Halloween, Xmas, Valentines Day, 4th of July, etc. so if you haven’t tried these, seriously check this one out. This is my 2nd (possibly 3rd) bottle! 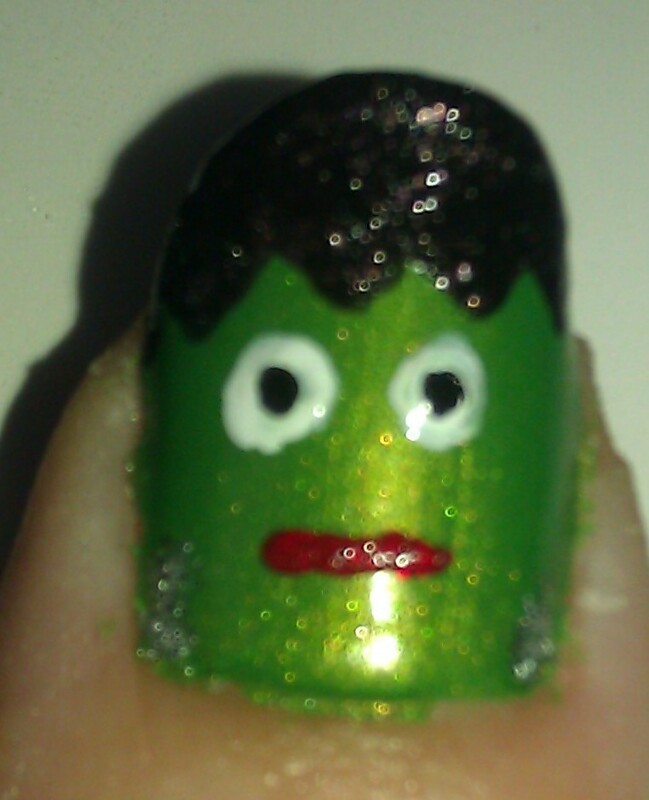 7 Finish off my using your smallest tool to literally dot the eyes haha. 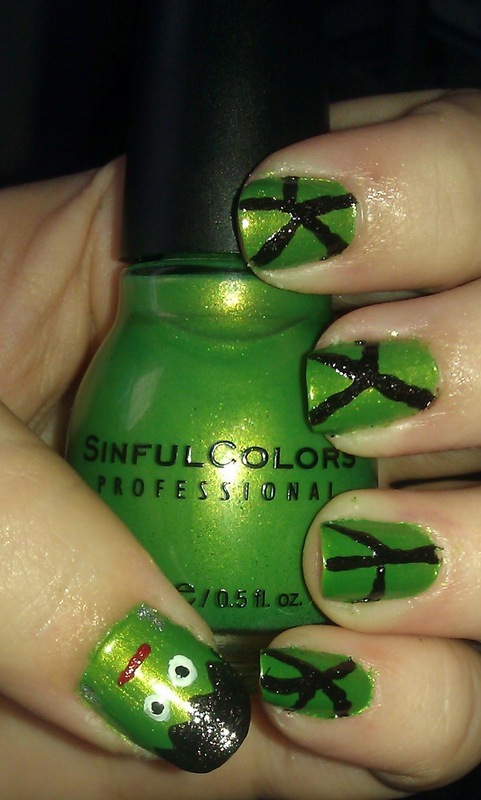 For this I used LA Colors Art Deco Polish in black which is different from the original black because it has no glitter. I think this makes it easier to see against the white and “blacker” as well. For the rest of my nails, I did random lines using LA Colors Art Deco in Back Sparkles for a “mummy wrapping” type of effect. I love love LOVE this today. I’m def going to be doing more nail art so definitely stay tuned if you’re seeking holiday ideas! Later on this month I will be posting my viewer variations and linking back to blogs if you have them! Are YOU participating in Polish Insomniac’s Halloween Link Party?